Bishop Eden’s Primary School is a small denominational school linked to the Episcopal Church and the Cathedral. This link is very important to us and we have a strong history and partnership with the Cathedral and the clergy there. Bishop Mark Strange and The Very Reverend Sarah Murray regularly visit the school, as do other members of the congregation who help out in school. We attend services at the cathedral and regularly share assemblies. 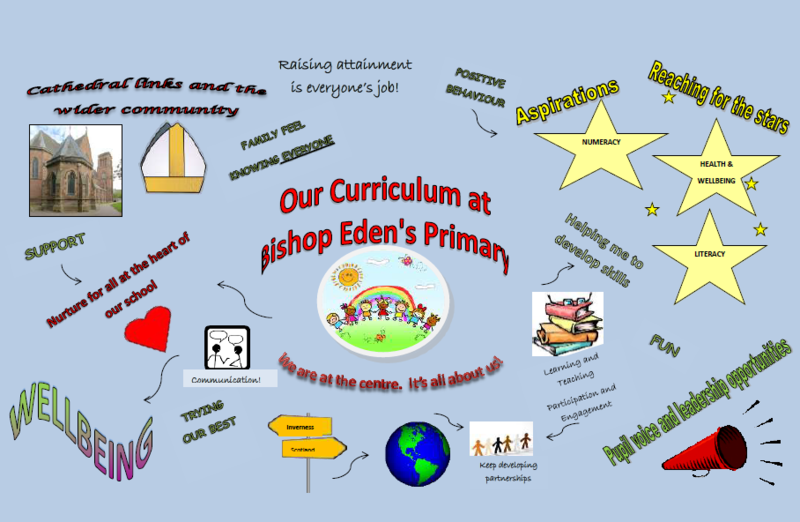 At Bishop Eden’s Primary School, the values we have chosen as most important in our school community are: Happiness, Hard work, Team work, Honesty, Positivity and Fun. As a community, we endeavour to ensure these values are part of everyday within the school and utilise them to encourage our pupils to reach their full potential through our curriculum for excellence. Transfer to Inverness High School is again by placement if pupils live outside of the catchment area.